..PNC to raise $25 billion internally Graphic -- The presidential candidate of the People's National Convention(PNC),Dr Edward Nasigre Mahama,has promised to increase the daily minimum wage from the current ¢11,200 to ¢50,000, if he wins the December elections. ''I still maintain the equivalent of a five-dollar minimum wage that I promised Ghanaian workers during the 2000 electioneering,'' he said. Dr Mahama was addressing a rally of the party at Kintampo in the Kintampo North Constituency as part of his campaign tour of some parts of the Brong Ahafo Region. He noted that the current daily minimum wage, which is just a little over a dollar, was inadequate and did not encourage workers to offer their best to ensure improved productivity. ''Nobody should tell me that to pay ¢50,000 as daily minimum wage is not feasible,'' he said, adding that the party had done its calculations and was sure that its budget could contain such a wage bill.He stated that until the country got its priorities right, the people would continue to live in poverty while leaders continued to enjoy. Dr Mahama said Ghanaian workers deserved a better deal to enable them to enjoy from the sweat of their labour. He noted that Ghana was not poor as the NPP government had made the international world to believe, saying that the country should learn to do things for itself, rather than being a dependent economy. ''Leaders who think that Ghana is too poor and go around the globe with a calabash in hand soliciting peanuts do not deserve to rule the country,'' he said.Dr Mahama stated further that the PNC had constituted an economic team which could raise $25 billion dollars internally to support its programmes, if it was given the mandate on December 7. 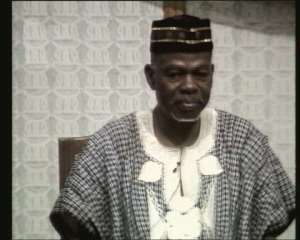 The Second National Vice Chairman of the party, Alhaji Ahmed Ramadan, said President Kufuor gave the unemployed a false hope when he compiled their names and promised to give them employment.He stated that the NPP was full of politicians who only thought about their own welfare and not about creating jobs for the unemployed. The PNC National Campaign Manager, Professor George Abango, called on Ghanaians to vote for Dr. Mahama since he was a man of integrity who knew how to solve the country's socio-economic problems.The National Organiser of the party, Mr Ransford Nii Noi, said that NPP's rule was a continuation of the NDCs administration and, therefore, did not deserve to have a second chance. Dr Mahama made whistle stops at all the villages along the Kintampo-Yeji trunk road and interacted with the people. The PNC presidential candidate also addressed rallies at Yeji in the Pru District and Kwame Danso in the Sene District to round off his campaign tour of the Brong Ahafo Region.